Welcome to Adrian Martin, new Crooked Cat author, who has an intriguing tale to tell. His debut novel is already burning a hole in my kindle, and has now been promoted to the top of the list. We have a few things in common, for I, too, was introduced to technology on a word processor, and then I did a distance education degree at a late age. Over to you, Adrian – it is good getting to know you! Hi, Jane. Thank you very much for having me guest on your blog. My debut novel, The Helland Reckoning has just been released by Crooked Cat and is set in the heart of the picturesque Cornish countryside. It is about an abducted child, a frantic mother and a stranger with hidden secrets of his own. Although it is now the complete product it took me several years to make it an enjoyable read, through a stop start process. I have written since I was in my early twenties, but it was poetry and not stories. I used it as a form of escapism while serving overseas in the army in Kosovo. I have recently read them, and if the truth be told they made me cringe, however, I was not to know that these were the foundation for a newfound love of writing. In about 2000 I was given an old word processor by a friend, who had upgraded to a computer (yep I remember the world before technology seized control). At the time I was reading a lot of Dean Koontz, an author many of us have been inspired by, and naively thought I could do just as good a job! After all, writing a book is easy, right? I couldn’t have been further from the truth and was quick to learn this. At this point, I had no plot, no idea and no knowledge of the writing process, but nevertheless I began to type. The first thing I needed was a location, and there was a place that for some reason has stuck with me since staying there as a child; it jumped on my nose and slapped me in the eyeballs, Helland. It is a quaint hamlet just outside of Bodmin, but is buried deep into the bleak moorland. With a name like this, and the lasting impression Koontz was leaving on me at this stage of life, the only genre I wanted to write was horror. The idea of making readers tingle with fear excited me. So, on and off for the next few years I tapped at the keys and eventually bought a laptop, which I could now take away with me while on my new career as a long distance lorry driver. Due to the long working hours it took me a while, but after about six years of stuttering, I finally had a finished manuscript, but now it was written what the hell did I do with it? I know, I will get an agent and make a million quid and retire overnight! How I can hear your tears of laughter from my desk as I write this. Anyway, after a few nice (and not so nice) get stuffed letters and a battered ego I shoved it away and left it to gather dust, hung up my mighty pen and moved on with life. But the next few years took a turn for the worst and nosedived, so much so I had almost become kamikaze during the lowest I had ever been. To get out of these holes and challenge life full on takes bottle and determination, and for someone special to walk into it and make you realise there are things worth living for. And this is what happened when I met my now wife, she made me understand what was important in life, and that we only get one shot. I had already lost one marriage. It was then the dusty and yellowed manuscript was withdrawn from retirement and passed over to someone that my wife had got chatting to while trying on school shoes for the girls in Clarkes. Freya helped me to get the ball rolling again and work on something I loved, but it was after this I was introduced to someone who was to become my mentor and friend. As fate would have it, she lived in the same village as me so this blossomed away from Facebook and her honesty with what I had written still remains with me. There was a lot of work to do, but with her patience she taught me how to write, how certain devices were used and the do’s and don’ts. At the time it was hard work, rewriting everything that had taken years to achieve, and my confidence ebbed away, until I re-read the finished piece. It was then I submitted to Crooked Cat, who accepted the manuscript and published it in June 2016. However, in September 2015, before my manuscript was accepted my wife had given me an ultimatum, either continue to be stuck driving trucks forever, or chase my dream of writing. A dream was achieved when I was accepted by Crooked Cat, it was a dream I had harboured for years and it was surreal when it happened, but that is not the end. My wife had spoken to the local college and found out about available courses and I subsequently gave up my career in driving and went back into education full time, where last year I studied an Access course in English, Literature and Creative writing, achieving mainly distinction grades. My journey will not be ending there, in September I begin my BA Hons degree in Creative Writing at Falmouth College of Arts. My journey so far as a writer has not been easy, and nor has it been quick, but it is most definitely heading in the right direction as I move forward. 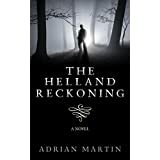 The Helland Reckoning is my debut novel, but it will not be my last as I am working on other projects concurrently. That said, I now look back on the hard work that has gone into writing it and know I have the ability to put a full length novel together and turn it into something people enjoy reading. Thank you so much to Jane for hosting me today, it’s has been a terrific experience and thank you to everyone who has bought The Helland Reckoning. What should have been a fresh start for Katie Tremain and her twin twelve year old daughters, (Sarah and Tegan) in the heart of the Cornish countryside, quickly turns to tragedy when, Sarah goes missing in the bleak and snowy surroundings of Bodmin Moor. There are no footprints surrounding the house from where she has gone missing, and no evidence of the girl. Before the police arrive, delayed by the unpredicted snowfall, a stranger arrives claiming he wants to help find Sarah. Katie has never seen this man before, yet there seems something familiar about him, and Tegan appears to have a connection with him. He has one stipulation – No police. Why, what are his true motives? A missing girl, a broken mother, a lonely sister and a stranger. Together they look for the missing girl, and Katie is shocked when the stranger’s true identity is revealed, and sickened when she finds out who has her daughter. This supernatural horror takes a mother to face her worst nightmare. Adrian lives just outside of Newquay, Cornwall with his wife, Lisa, and four children. He began writing while serving in the British Army, starting with poetry written on blueys (blue sheets of paper that fold into envelopes) as he was on a peacekeeping mission in Kosovo. After leaving the army, he tried being a security guard, but found walking around the supermarket for fourteen hours a day somewhat monotonous, so decided to give long distance lorry driving a go. It was whilst doing this he began to pen “The Helland Reckoning”. The novel was inspired by the small hamlet of Helland, where Adrian stayed with a friend as a child. It had remained in his thoughts for many years, so it became the natural setting for the book. After five years of tramping around the U.K and Europe, he decided it was time to be home more, so began driving fuel tankers around Devon and Cornwall. After breaking his ankle playing football, Adrian was made redundant so set to work rewriting the manuscript. However, Adrian’s last job, working for a portaloo company (which was actually a lot of fun) made him want to chase his dream as a writer, so in September 2015 he returned to full time education studying English, literature and creative writing, achieving mainly distinction grades along the way. He begins a creative writing degree, at Falmouth University, Cornwall in September 2016. His hobbies include spending time with his family, writing, football, skiing, walking and Facebook! Feel free to hunt him down and chat. This entry was posted in Authors and tagged Bodmin, British Army, Cornish countryside, Crooked Cat, Dean Koontz, horror, kamikaze, Kosovo. Bookmark the permalink.